After updating to the latest EA Sims 4 patch that released on 14th July,2016,many simmers who use custom contents faced error with their installed cc lights.If you're one of them you can easily fix your all broken cc lights in your Mods folder by one click using Sims 4 Studio. 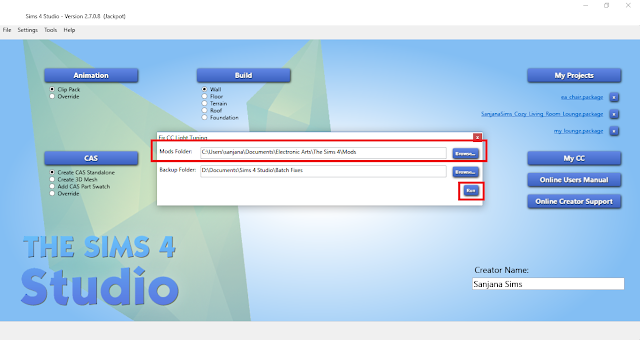 Download the latest version of Sims 4 Studio Jackpot and install it.Note that registration is needed in Sims 4 Studio Forum before you can download. 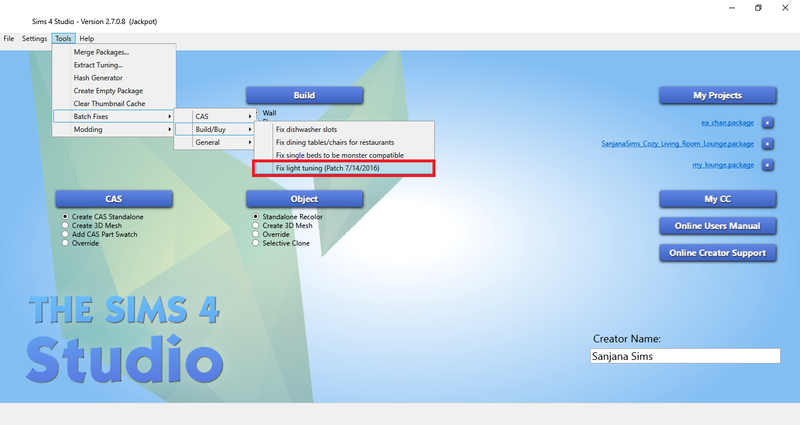 Open the Sims 4 Studio and click on Fix Light Tuning (Patch 7/14/2016) as shown in the below picture. Specify your Mods Folder by clicking on the Browse button if not already specified.Then click on the Run button. The Sims 4 Studio will now give you the result on how many lights have been fixed,how many lights are unable to be fixed and how many lights don't need any fix.That's it.Your fix is done.However,if you see on the result that one or a number of lights are unable to be fixed,then you need to contact the Creator of those specific cc lights to get a fix. Hi, I downloaded the new Sims Studio Jackpot and have done all the steps and clicked run and now there's a box that says "Re-tuning un-tuned lights" with a little circle going around which I assume means it's working on it, but it's been doing this for a few hours now. 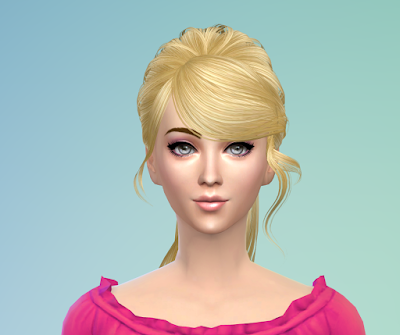 I do have a lot of CC but should it take this long? Do you know off hand how long it takes approximately? If you could let me know or give me some help with this it'd be greatly appreciated, thanks so much. It's strange that it's doing this for a few hours because it should not take that long even if you have a lot of cc.Try to cancel the process and run it again.